The Naked Bavarian is 20 mile (or 40 mile option) race hosted by Uber Endurance Sports outside of Reading, PA. A lollipop course set along Blue Marsh Lake, the mostly single track trails brought us through woods and fields showcasing much of the late winter beauty that eastern PA has to offer. And its wind! All 30 miles per hour of it! Aid stations were strategically placed every 3.5 miles and they were well stocked with water, Gatorade, food and candy. Many, many thanks to the race director and the army of volunteers that kept us all going at those aid stations. For me, 20 miles warrants two hydration packs of Tailwind, so I annexed my wife’s pack to go along with my own. However, upon arriving at the race start, the soaking wet base of my backpack inarguably demonstrated that one of the hydration packs was leaking profusely and rendered useless. I was certain it was mine since my wife had never mentioned an issue with hers and I knew I had issues with mine in the past. I dumped mine and carried on with hers. If one of the knights from Indiana Jones and the last Crusade had been there to watch me, he would have said, “He chose poorly”. Turns out my wife’s hydration pack was the problem. Big time. From the start, I had a nice steady cool trickle of tailwind running down my back and soaking me right through my undies. A mile in and I knew this was not going to be good. I made a fateful decision and tossed my bag, deciding to rely on just the hydration provided by the aid stations. Side note, to add insult to injury, after getting to the van post-race, I discovered my hydration pack was sitting full of Tailwind and not leaking at all. Not even a drop. Sweet. A slight pain began to manifest in my left foot early on but nothing so bad that I couldn’t just ignore it. If you want to partake in endurance running, one must be comfortable with suffering I told myself. On I went. By the time I entered the loop portion of the race, over seven miles in, I was feeling good, and had actually settled into a decent pace and was chatting it up with fellow runners along the way. What turned out to be the most challenging hill was just after the hallway point. I would argue that its three false summits made it more of a mental than physical challenge to overcome. There is nothing like reaching the top, being proud of your achievement, only to look up and have the hill slap you back to reality. And then do it again, and then once more for good measure. 11.45 miles. I remember seeing those numbers on my watch and that’s when I had a realization. Tailwind works. No placebo effect, no imagining some effect that is not there, it legitimately keeps you hydrated and consuming a steady supply of nutrients all race long. Tailwind works. I know this because…I didn’t have any, and at 11.45 miles I had to jump over a blow down, and I felt that instant searing pain and cramp in my calf muscle. Before this race, I completed the 13.5-mile Frozen Snot with 5600’ of elevation gain, and the 27 mile Boulder Beast with about 5700’ of gain the year before, with a cumulative 15 hours on my feet. I had a steady supply of Tailwind and no cramps, not a one. This day turned out to be much different. 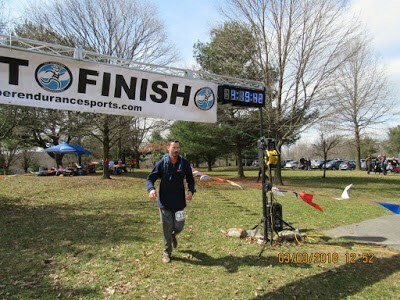 The latter half of the race devolved into a run-as-much-as-you-can-until-your-legs-nearly-lock-up, and then walk it out. Live-Die-Repeat. My average pace went up about three minutes per mile and the pain in my foot progressed. In the end, if you want to be an endurance runner, you have to be OK with suffering. I was not about to let the course, or my poor life (hydration) choices beat me. I was able to manage the pain, push to the point just before my legs locked up, and then walk it out. I hobbled my way back down the stick of the lollipop until I found my bag. A few deep pulls on the hose and it was empty, a small patch of woods receiving the benefit of my water-electrolyte-calorie-salt amazingness (I guarantee that patch of grass is going to look stellar this spring). It was enough to get me across the finish line and at that point that was all I wanted. In the end, I think it’s good to know if something actually works, or if you just think it works because you are telling yourself it does. This experiment was not one I would have chosen to conduct; however, I now know that anytime I race, I will be going out with a full (leak-proof) pack of Tailwind.